Meghan Markle's Trooping the Colour debut was infiltrated by a lip reader employed to get the scoop on what was being said between the royals. Meghan Markle's debut at the Trooping the Colour was mostly positive from the media after Saturday's annual event (June 9), but there were a few bumps in the road for the newest member of the royal family. Meghan looked gorgeous in her off-the-shoulder designer dress, which is what some of the critiques conveyed about Prince Harry's wife. While her "classy" and "elegant" presentation was reported by various media sites, some folks on Twitter found fault in the attire Meghan picked out for the event. Wearing a dress that displayed her bare shoulders during an event for the queen during daylight hours was seen as a bad choice by some social media users. The act of Meghan exposing her bare shoulders was deemed as "inappropriate" in a few Twitter posts, according to Fox News. Others hopped online to say that Meghan was about to thoroughly modernize the royal family with her modern-day views. This was seen as a positive move among the Twitter users who conveyed they welcomed Meghan's influence. Appearing at Trooping the Colour for the first time, which is also called the queen's birthday parade, offered up a few nervous moments for Meghan. That is where the lip reader came in. Harper's Bazaar reports that a lip reader was brought in by a media site to catch the conversations among the royals when they were out of earshot of the crowd. As Meghan and Harry waited for the Royal Air Force fly-by on the balcony at Buckingham Palace, the couple shared a few private words. These are the words that the lip reader was able to decipher and share with the masses via the many media sites reporting on this today (June 10). It appears Meghan shared with her new husband that she was feeling a bit nervous up there on that balcony with the rest of the royal family around her. Harry offered up words of comfort to his "nervous" wife. According to what the lip reader reported, the conversation started with Harry asking his wife if she was "Okay." Meghan replied "Yeah" and then asked Harry how he was doing. After these few words, Meghan then confided in Harry that she was "nervous." Harper's Bazaar suggests that while Meghan might have been a tad bit nervous, she didn't show it. Harry then gave Meghan the run-down of what was coming next with this event, so she would know what to expect. 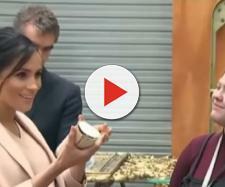 The words the lip reader revealed coming from Harry while explaining to Meghan seemed to contain a bit of humor. Harry told his new bride; "Then there's the fly-past and then we all look up to the sky." It sounds as if Harry may have attempted to get a smile out of Meghan by telling her where they will look to see this fly-past, which is "up in the sky." You would never know that Meghan was nervous, suggests the article from Harper's Bazaar, as she chatted with her new father-in-law, Prince Charles, and her new sister-in-law, Kate. Then, of course, she had Harry by her side for support who has been "looking up in the sky" to see this "fly-by" since he was a toddler. You really didn't need a lip reader to see the support Harry was offering up to his wife. He remained within arm's length of Meghan while she embarked on her first Trooping the Colour event.